Since its 1786 debut performance in Vienna, Austria, Mozart’s The Marriage of Figaro has been performed countless times around the world. It’s a big production. A full three hours in length, it’s an energetic recounting of servants Figaro and Susanna’s wedding day, humorously complicated by the licentious interest of Figaro’s aristocratic employer in the bride-to-be. 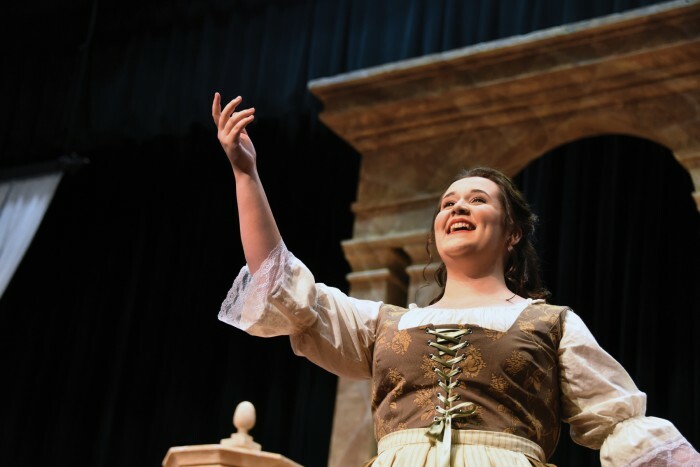 Branham expressed great appreciation for the support she received from many people connected to the school and production. But two names kept coming up: Tonya Currier and Gene Fleischer. Currier, a part-time voice faculty member and the administrative director of the American Opera Institute, is the reason Branham wanted to return to Augusta after briefly studying music elsewhere. And Fleischer and his late wife, Lucille, with their generous and longtime patronage of opera in Augusta, are the reason she was able to. Currier, an accomplished and award-winning operatic soprano, has long been part of an active and generous group of local opera enthusiasts working to bring top-quality performances and vocalists to Augusta. Chief among that group have been the Fleischers, who arrived here in the ’70s and immediately immersed themselves in the local music community. Growing up poor in New York City, Lucille’s love for opera began during free performances of the Metropolitan Opera at the local library. Gene is an accomplished musician who plays several instruments. Their 1942 marriage, which lasted 71 years until Lucille’s death in 2013, was born amid a mutual appreciation for music, which Gene continues to this day. The Fleischers long supported both the city’s Augusta Opera and the university’s music programs, establishing two endowments with the university’s foundation that support opera and music scholarships. Branham is a scholarship recipient. “Without his contributions to the Augusta Opera Scholarship fund, I couldn’t afford tuition,” she said. Gene underwrote the production of The Marriage of Figaro – the first opera performed in Augusta in four years. Its mix of professional and student performers provided students tremendous opportunities to learn from the pros and grow in their craft. Branham especially appreciates the personal interest Gene takes in her and other students’ work. “That someone of his stature in the community is taking time out of his schedule to see us perform … that just means so much,” she said.